June 23, 2010 — The Weather Network is in StormWatch as we monitor the potential for severe thunderstorms in southern Ontario today. Heavy rain, frequent thunder and lightning, and the potential for large hail and tornadoes. All the ingredients are there for this to be a night of active weather across southern Ontario. A low pressure system in the United States is picking up steam as it tracks towards the province. 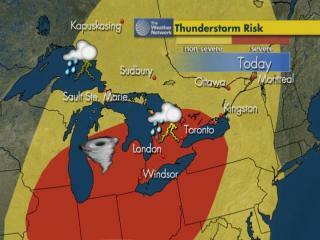 It could start bringing severe thunderstorms to parts of Ontario as early as this afternoon. The potential is there for these storms to be severe in nature, which means there is also the possibility of tornadoes. Right now, the risk of severe weather extends from southwestern Ontario, north to the Bruce Peninsula and across the Greater Toronto Area. Be sure to keep an eye on Watches and Warnings throughout the day. If you have active weather in your area, call our Stormline: 1-800-463-9463. You can also tune into The Weather Network on TV for up-to-the-minute coverage of this active weather throughout the day.